Chipotle's annual promotions are predictable. You know when they're coming, and you usually know what you're getting. Halloween is a pillar for the boorito joint, though this year's deal isn't quite as alluring as it has been in previous years. You could once land yourself a $3 meal by wearing a costume, but times change. This year, head to Chipotle in a costume on Halloween and burritos are just $4 (yes, they're calling burritos "booritos," and why wouldn't they?). The deal is available from 3pm to close and applies to burritos, bowls, salads, and orders of tacos, in case you didn't get your fill on National Taco Day. You'll still have to pay extra for guac, though. The deal is available both in-restaurant and via delivery, which you can order right in the Chipotle app as of August of this year. Just end the promo code "BOORITO" before checkout and your lunch will get the festive price cut. 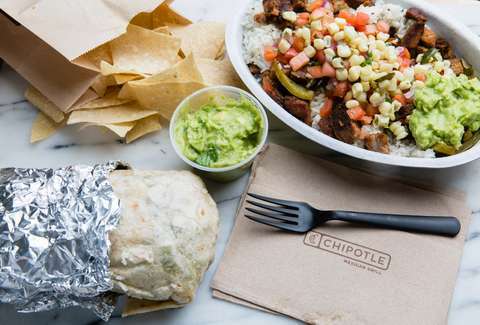 "Boorito is a longstanding Chipotle tradition that's beloved by our fans," said Chris Brandt, chief marketing officer at Chipotle, in a statement. "We love contributing to the Halloween spirit and seeing our customers show off their fun, creative costumes to celebrate Halloween and enjoy some of their favorite food." In addition to the boorito deal, Chipotle is also staging a Halloween costume contest on Instagram. All you have to do is post a photo (or Instagram Story) of yourself in costume at a Chipotle location and tag @chipotle. The burrito slingers will choose eight finalists and fans will ultimately choose a "Boorito Champion" on November 1. The winner will receive a year of free burritos. There won't be quality judgments on your costume from the Chipotle staff (probably), but you definitely get bonus points in the hearts of everyone around you for having something unique. Instead of going with someone from Black Panther, Solo, or Westworld go as Red Gerard, a skull asteroid, or the seal that slapped a boater with an octopus.